the connection of the bridging seam. The upper part is put into the skirt, right sides inside, aligning the side tucks and marks on the bodice and on the skirt, smatyvay and grind from the top. To prevent the seam from stretching under the line connections enclose an edge of the base material, positioning the seam of the edge to the side edge of the lower part (Fig. 537). You can connect the top with bottom without stitching the edges. 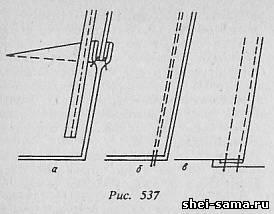 In this case, the grinding operates in two lines with distance between them of 0.1-0. see weld Width of 1-1,5 cm ( Fig. 537 b). Joint width from the top can be increased to 4 cm.The slices seam overcast. Connection patch seam. Cut the top part bent towards the inside at the intended line, or by an amount equal to the width of the finishing stitches plus 1.2-1.5 cm, zametyvayut and priorivet. The processed edge is applied to the lower part, namachivajut, and then scribbled (Fig. 537). The splice seam priorivet from the inside out and from the front side through a damp protohellenic. of the Processing upper edge of the skirt grosgrain ribbon.Grosgrain ribbon primatives to the skirt after the closure, treated with tucks and gathered the excess cloth skirt width. Grosgrain braid should be tight fitting shape at the waist. Its length is equal to waist circumference plus 3-3. 5 cm the processing ends. Grosgrain ribbons are folded on the middle line, iron along the fold, pulling it to reflect the expansion of the skirt at the hip line. On the tape the chalk outline the location of the side seams, gussets, Darts, middle front and rear panels of the skirt.One edge of the tape is applied to the upper section of the skirt from the wrong side of 0.7-1 cm, namachivajut and scribbled on the side of the skirt, evenly distributing the fit of the skirt and aligning the chalk line with the reference marks. The allowances for processing all grosgrain ribbons are distributed as follows: at the edge of the lower hand clasps 2-2. 5 cm, on the upper side of the clasp to 1 cm for nadziejko (Fig. 538 a, b, C). The end of the tape top side zipper of the skirt to buckle inside on 1 cm and the bottom part of the braid, pricechannel to the skirt, sew the hooks nose up at a distance of 0.7 cm from pritochnogo edges and bent from the transverse edge at 0.1 cm the Hooks are sewn by hand, 3-4 stitch for each eye and near the bend of the hook. The edge of the braid bend, are placed under the ends of the hooks and sew hidden stitches. From the outer side to the grosgrain tape pritachivajut two hangers of lining fabric or made from yarn. The length of the hangers in finished form should be 7-8 cm They put the front of the cloth at a distance of 2-2,5 cm from the side seams. Grosgrain ribbons bend towards the inside of the skirt and spawn the top edge of the skirt by hand, making the edge of a fabric top with a width of 0.1-0.2 cm Sweeps the upper edge of the skirt slightly priorivet from the inside. Thread from vumedi removed and finally priorivet belt on the reverse and a front side through a damp protohellenic. Processing of the upper edge of the skirt with a fold-over waistband (Fig. 539). The belt for the skirt cut out the common thread. The belt is folded face inward, and the ends of the belt to grind the seam width 0.5-0.7 cm so that one end of the belt buckle was straight and the other had the shape of a Cape. Allowances of seams, in corners cut, leaving a 0.2 cm Ends of the belt are turned inside, straighten the corners and spawn priorivet. Waist outline with chalk the location of seams, tucks and pleats. The zone is applied from the front side to the top of the skirt and primetyvajut seam width 0.5-0.6 cm, aligning the seams and Darts with nasecki on the belt. Then the belt pritachivajut seam width 0.7 cm, place at the top are placed face-down strip of silk or cotton. Strip can be both single double. Pritachivajut the belt from the bottom to the edge of the top side of the clasp, securing the ends of the lines. The ends of the belt must match exactly with the edges of the clasp.The belt is bent, straighten the seam, the edge of the strip bends to 0.7 cm and zastrugivajut at a distance of 0.1-0.2 cm from the bent edge, With the stitching reinforce the ends of the hangers the opposite line. Seam protecive belt priorivet from the inside. Then the belt is folded on the front side, releasing the side of the inside edge with a width of 0.3 cm, and primetyvajut. From the inside belt is attached with five or six manual concealed stitches at a distance of 0.5 cm from the bottom edge. Clip located at a distance of 10-12 cm from one another. 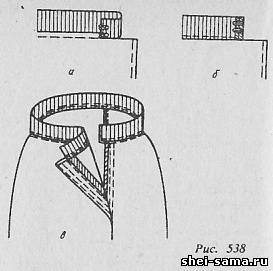 Processing of the upper edge of the skirt with a stitched belt (Fig. 540 a, b, C). The belt is put on wrong side upper edge of the skirt and primetyvajut, evenly distributing fit and combining marks. At the same time primetyvajut hangers, placing them symmetrically relative to the middle of the front and rear panels of the skirt. The ends of hangers are inserted between the belt and skirt. Belt pritachivajut to the skirt seam with the width of 0,5-0,7 see the End of the string is fixed by a double line. Seam priorivet, Sturova the fit of the skirt. The ends of the belt is folded inside out and sew seam with the width of 0,5-0,7 seeThe corners are trimmed, turn the belt on the front side and spawn. Outdoor cutoff bends at 0.5-0.7 cm and zametyvayut. Bent section of the belt is applied to the front side of the skirt and namachivajut, closing the seam protecive zone. The inner side of the belt priorivet through wet protohellenic. Then the belt prostrachivajut at the top, bottom and side edges. Line have a distance of 0.1-0.2 cm from the edge. If the belt according to the model not prostrachivajut, the bent edge zone file manually or prostrachivajut the seam protecive zone.Ready priorivet belt inner side through a damp protohellenic. At the ends of the belt vymatyvayutsya loop and sew a button or hooks and loops. Similarly treated with upper edge of pants.